Natalie and I spent Monday and Tuesday at Universal and Islands of adventure! It was a blast as always! We spend all day riding rides! Tuesday night, Rick Linda, Rhea Geofrey (there kids) and Natalie and Hyatt, went to the airport hotel to be ready for our early morning flight to the Cayman's! When we got there it was very hot, but I could already see the Chrystal blue water! We stayed at the Ritz Carelton which was a real treat! Our part of the hotel was right on the ocean so we had a beautiful view of the ocean and pool! The first thing Natalie and I did was go straight to the pool! We had lunch and played for hours. We made our way to the beach a little while after which was very nice. The water was perfectly clear with super white sand! The next day Natalie and I went horse back riding on the beach, and wow that was amazing!! Natalie and I have always shared a love for horses and so it was a very wonderful experience to be able to ride horses on the beach. Of course it was a trail ride to insure safety which was fine with us. However when one of the men that owned the place found out we knew how to ride horses, he let Natalie and I gallop. And I mean gallop!!! We rode those horses as fast as we could at least a mile and half, a couple of times! It was such a thrill! We were also able to ride the horses in the water which was just beautiful. It was an amazing experience and I really am grateful for it. This world is truly a beautiful creation and I feel blessed to be able to visit some of the beautiful places Jesus Christ created for me. Friday the family rented a very nice...large boat, for the day. It was so much fun just riding in the boat. We were pleased that it was private for just us that day so that we could enjoy everything on our own time. Our first stop was sting ray city. 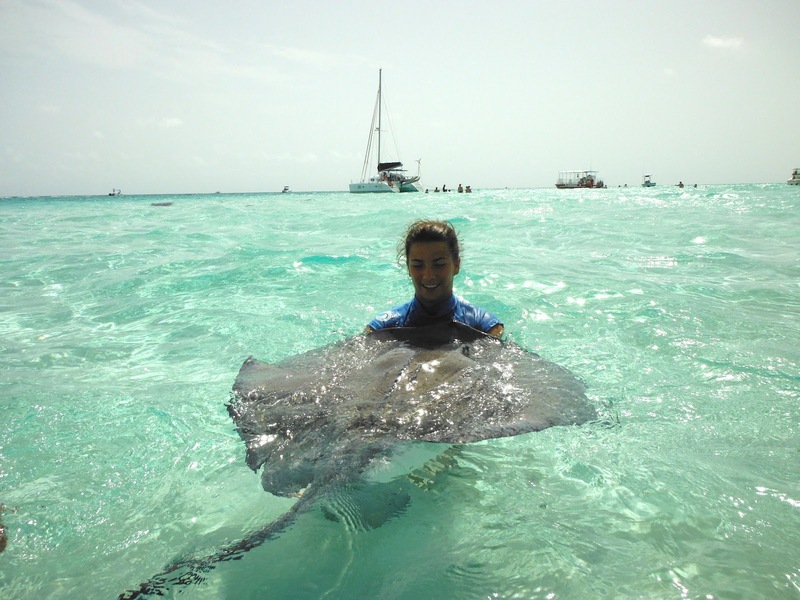 Which is literally just out in the middle of the ocean were a lot of sting rays like to hang out. 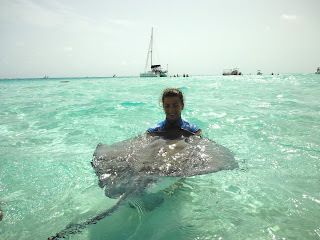 I was amazed when we arrived and I saw numerous sting rays EVERYWHERE! They were so many of them, weighing over 80 poulnds! The craziest thing was that they were wild. This was not a zoo, or anything of the sort. This was the ocean. Our captain told us that the sting rays are used to people comming, and that if they wanted to leave the sting rays can swim up to 40 miles per hour. I was a little nervous at first but as soon as one came up to me, I felt okay. It was a lot of fun. Later on in the day we jumped off of the rope swing at the top of the boat, and rode in the hammock. Listened to music and enjoyed eachothers company, it was a wonderful day. Saturday we did a little bit of shopping, and then went to play in the ocean! Natalie and I went paddle surfing, and laid out in the floats. That night we babysat the kids, which was a lot of fun. We took them to a movie, and to dinner, and to go night swimming, while the parents went out to a fancy dinner. Look at all those stingrays swimming around our feet! I jumped off the top of the boat..not the best picture but thats ok! Natalie and I went to hunt for sea glass and shells! The boys at the movie! Im holding a stingray named freckles! we held some huge starfish! My horses name was Summer! The trip was truly a dream vacation! I enjoyed every minute of it! Thank you Teets family!